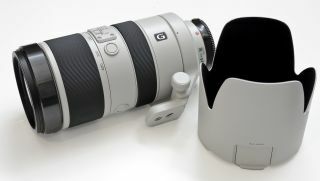 Sony has designed new optics exclusively for its A-mount series of Alpha DSLTs, which include a prime Carl Zeiss lens, a telephoto optic and a new standard kit lens that will be bundled with new DSLTs such as the Sony Alpha a58, which was also announced today. Both the new 70-400mm f/4-5.6 G SSM II and Carl Zeiss Planar T* 50mm f/1.4 ZA SSM lenses complement the full-frame Sony Alpha a99, which was announced at the end of last year, but are both also compatible with APS-C devices. First up, the new 70-400mm f/4-5.6 G lens is designed with wildlife and action photographers in mind, and is an upgrade from the previous design. Enhanced optics and a faster, improved autofocus are included with a new LSI drive circuit, with a four times quicker autofocus speed promised. Enhanced tracking AF makes the lens more suitable for capturing fast-moving subjects. Although the optical design is carried over from the previous model, the new generation lens features Sony's proprietary Nano AR Coating to reduce reflection, flare and ghosting. Next up, the Carl Zeiss, Planar T* 50mm f/1.4 ZA SSM lens joins the existing 24mm, 85mm and 135mm prime lenses available for A mount cameras. Featuring eight elements in five groups, with two aspherical elements, the design of the lens is especially matched to the full-frame Sony Alpha a99. Lastly, the new 18-55mm "kit lens" succeeds the existing optic that was introduced in 2011. It retains the same smooth AF motor as its predecessor but features newly-designed rear lens elements that have been upgraded for a more comfortable operation. Two new accessories have also been launched, which include a new compact on-camera flash and wired remote.